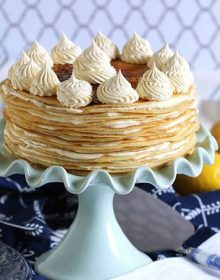 Layers of light crepes are turned into a wonderfully delicate Lemon Mascarpone Crepe Cake. Allow the batter to rest for 1 hour. Heat a small non-stick skillet over medium heat. Melt 1 teaspoon butter in the pan. Pour 1 ounce of the batter into the center of the pan and swirl with a spatula to spread evenly. Cook for 30 seconds and flip. Cook for an additional 15 seconds and transfer to a baking sheet. Be sure the crepe is flat so it can cool. Repeat with remaining batter. After the crepes have cooled completely, stack them and store in sealable plastic bags in the refrigerator for several days or in the freezer for up to two months. When using frozen crepes, thaw on a cooling rack before carefully peeling apart. In a large bowl, beat the lemon curd, mascarpone cheese, heavy cream and sugar until light and fluffy. Set aside. Assemble the cake by placing one crepe on a flat surface such as a platter or cake stand. Spread 1 heaping tablespoon of cream in a thin layer over the crepe. Top the cream with another crepe being sure there are no wrinkles and the crepe lays flat. Repeat with the remaining cream and crepes. Lightly cover with plastic wrap and transfer to the refrigerator for 4 hours or overnight. Remove the plastic wrap and sprinkle the top of the cake with the turbinado sugar. Using a kitchen torch, melt the sugar to create the crispy top. Decorate with the remaining lemon Mascarpone cheese.